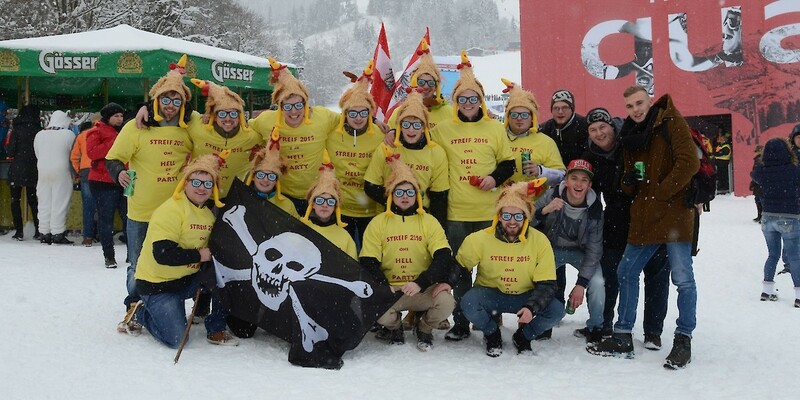 „The atmosphere at the Hahnenkamm Races is unique“, the group of youngsters from Upper Austria are excited and turn out to be die-hard Kitzbühel fans - after all, this is the third time they have been to the Hahnenkamm Races. Hannes Reichelt's fan club have all turned up in rooster costumes. His followers from Stanz in the Mürztal Valley are unanimous on one thing „Hannes is going to win today! He is the best and has got the best fans". The Styrians were on the sidelines when Reichelt celebrated victory two years ago in Kitzbühel. Many fan groups have gone to the Trouble of travelling huge distances to get to the races. A Norwegian waves his flag while shouting: „Svindal! Svindal!“ He is quite certain that his favourite will win the Hahnenkamm Downhill today. Whether he is right or not will become apparent very soon.